← Bolivia under undeniable extortion facts! 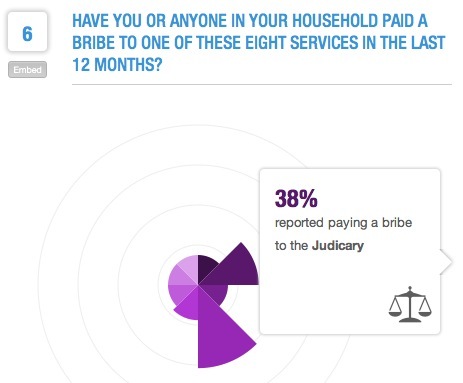 Bolivian Corruption 101: Where Bolivia falls under the 2013 Corruption Barometer? (Reuters) – A majority of people worldwide believes corruption has worsened in the last two years and they see governments as less effective at fighting it since the 2008 financial crisis, a survey by Transparency International organization showed on Tuesday. The “Global Corruption Barometer” is the biggest ever conducted by the Berlin-based watchdog, with 114,000 people responding in 107 countries in the survey of opinions on corruption and which institutions are considered most corrupt. 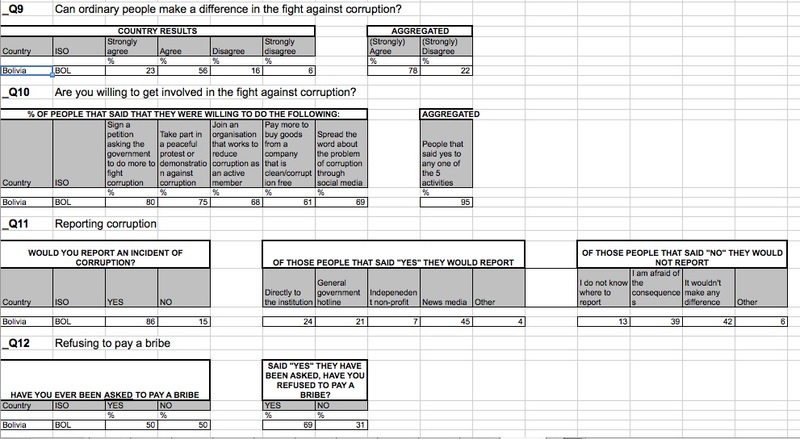 Only 23 percent of those surveyed believed their government’s efforts to fight corruption were effective, down from 32 percent in 2008. The second most corrupt institution on a global scale is the police with a score of 3.7. Three categories of institutions – public officials/civil servants, parliament/legislature and judiciary – followed with equal scores of 3.6. “It is the actors that are supposed to be running countries and upholding the rule of law that are seen as the most corrupt, judged to be abusing their positions of power and acting in their own interests rather than for the citizens they are there to represent and serve,” Transparency International wrote. The media did not fare as badly, coming in at the ninth place out of twelve with a score of 3.1, but it was seen as the most corrupt in Australia and Britain. Some 69 percent said it was the most corrupt institution in Britain, up from 39 percent three years ago. “This very sharp jump is in large part due to the series of scandals around phone hacking, the Leveson Inquiry and the concentration of media ownership,” said Robert Barrington, head of the British unit of Transparency International. The Leveson inquiry into the ethics of the British press was set up in the wake of a scandal over phone-hacking at one of the newspapers of Rupert Murdoch’s media empire, which has a strong grip on the media in both Australia and Britain. Transparency International noted that even though religious bodies fared best of the 12 major institutions overall, in some countries they are nevertheless as being “highly corrupt”. In particular in Israel, Japan, Sudan and South Sudan, religious bodies scored above four on the scale of 1 to 5. 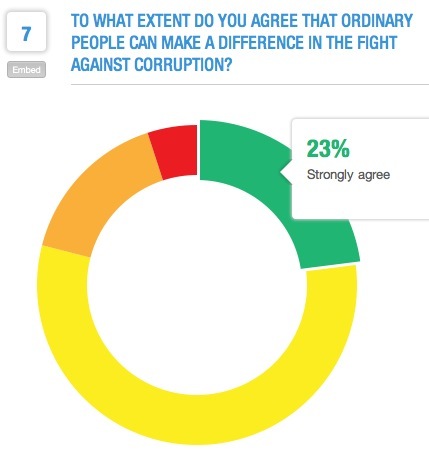 Independent if Q12 above, Bolivians would like to live free of corruption but the environment is SO pernicious! Just as an example, take any Bolivian regardless of social class, education, money… when we are abroad, we comply with the Law and are exemplary citizens… we come back and start throwing trash in the streets, driving like made men and cutting lines, we go back to our old behavior, why???? This entry was posted in Bolivia, Business, Crime and Violence, Drug war - narcotraffick, Economics, Energy, Environment, Health, Mining, Politics, Social Unrest and tagged bad politics, corruption in public office, democracy in peril, MAS does more damage than good, police and judicial corruption. Bookmark the permalink.